AVALON — After 2014 came to a somber close on Catalina Island, the Avalon City Council opened its first meeting of 2015 by remembering the two lives lost during a year-end storm and recognizing law enforcement, first responders, volunteers, city employees and private citizens who served the community because of the damage from by severe weather conditions. Council members also declared a local state of emergency for Avalon Harbor at its Jan. 6 meeting. The Jan. 6 meeting started with dozens of first responders and law enforcement officials standing along the council chamber’s back and side aisles, all paying tribute to the losses of Harbor Patrol officer Timothy Mitchell and local boater Bruce Ryder, both of whom died during a heavy storm that hit Avalon Harbor the evening of Dec. 30, 2014. “That was a very unpredictable, violent, ravishing storm. We lost two really close people to us. They gave their lives for us,” Council member Joe Sampson said. According to news reports, Mitchell, 39, died after he was pinned between a boat and a rock during the powerful late evening storm. Ryder, 53, was reportedly found floating in the harbor after the storm. He had a boat – Ocean Ryder ­– in Avalon Harbor and reportedly was a regular customer at The Marlin Club, a bar in Avalon. His death, according to the Coroner’s Office, was deemed to be “water-related.” The bar’s owner, Tony Underwood, told the Los Angeles Times he would temporarily assume care of Ryder’s dog, Pretty Boy. As of press time, it was not confirmed whether the deaths of Mitchell and Ryder were connected. A memorial was held for Mitchell Jan. 8, while Ryder’s service took place two days later. During the Jan. 6 meeting, a member of the Harbor Patrol led council members and attendees in an invocation and moment of silence to commemorate Mitchell and Ryder. Moments after the invocation and remembrance, council members unanimously approved a resolution declaring a local state of emergency. According to City Manager Ben Harvey, the state of emergency is similar to one adopted after Hurricane Marie in September 2014 and is a necessary action to secure federal, state and county funding to help recover from the damages caused by the Dec. 30 storm in Avalon Harbor. Jordan Monroe, a management aide with the city of Avalon, said paperwork for the approved local state of emergency would be sent to county officials. After county review, the paperwork would be forwarded to the state’s Office of Emergency Services. At the state level, the paperwork is reviewed Gov. Jerry Brown. Monroe added the city is “still assessing the extent of damages to City owned facilities and infrastructure.” However, as of Jan. 9, city officials estimated damages from the Dec. 30 storm to be about $6 million. “We are aware of specific damages to private infrastructure and facilities and we do not have any of those numbers or assessments, thus those numbers are not included in the $6 million estimate,” Monroe said. Also according to Monroe, some of the areas damaged by the Dec. 30 storm were damaged during Hurricane Marie. Multiple news reports indicated a seawall was damaged and four boats beached. The city had reportedly been cleaning up debris since the weather conditions calmed. The National Weather Service’s Los Angeles division posted messages on Twitter about the storm’s development and impact. 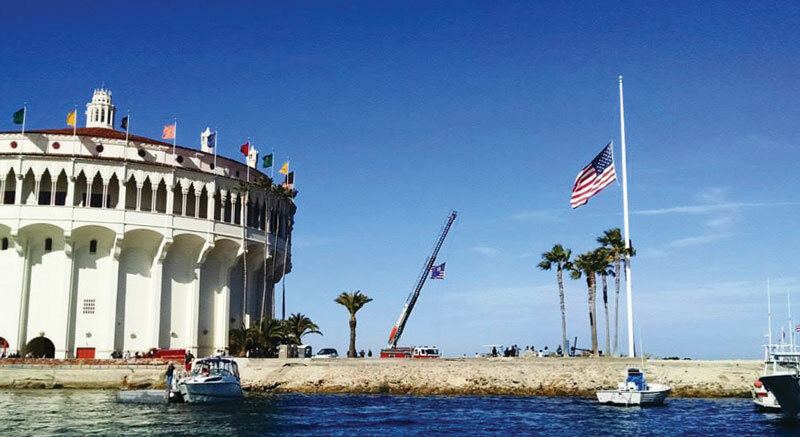 In the Jan. 30 issue of The Log, we will look into how boaters based in or heading to Catalina Island could be best prepared if caught in inclement weather and if there are any portions of the island a boater should try to get to if they cannot reach Avalon. Catalina Island is no stranger to inclement weather conditions, some of which will be discussed in the next issue. One reported event occurred in May 1988, when Avalon Harbor was shut down after gale-force winds caused several boats to be beached or otherwise damaged. According to news reports, wind gusts reach 60 miles per hour. At least one boater reportedly lost his life after falling off his sailboat.